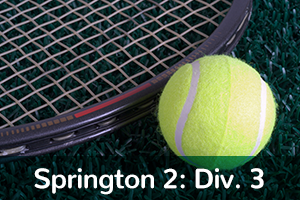 Once again, Springton will be participating in the Deltri Suburban Tennis League. Fifteen area tennis clubs comprise the league. All matches are doubles and are played on Fridays beginning in October at a cost of $15.00 per match per person. Springton fields a Division 1 team (ratings 3.5 to 5.0), a Division 3 team (ratings 3.0 to 4.0), a Division 4 team (ratings 3.0 to 4.0) and a Division 6 team. Match scores and team rosters are provided with the links below. If you want to visit the website for Deltri Suburban League: click here!